What’s up with the dead birds? A study skin displayed below a taxidermy mount in Bird Hall. Museum visitors sometimes offer spontaneous testimony to the deceptive power of taxidermy. “There’s a dead bird!” is a comment frequently voiced by people encountering a bird specimen lying on its back in Bird Hall, such as the Wilson’s phalarope pictured below. These specimens, so often called “dead birds”, are actually called study skins. and glass eyes of the appropriate size and color, the cotton-stuffed study skins appear lifeless. skeleton core, and internal organs, preserving every feather of the creature. Such Uniform preparation creates a standard for comparisons of features between both similar and strikingly different specimens. 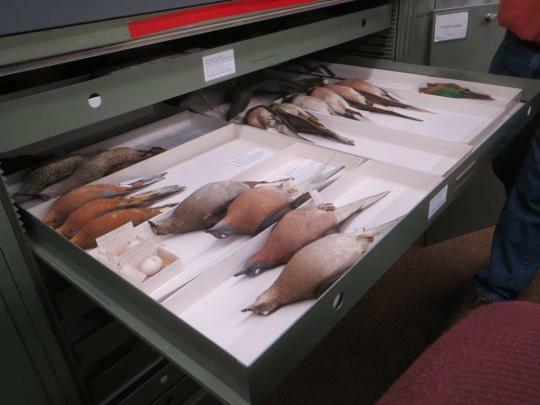 In addition, the low profile of study skins allows for their storage in shallow cabinet drawers in the manner of the passenger pigeon study skins pictured below. Although taxidermy mounts far outnumber study skins in Bird Hall display cases, the “skins” play an important role by representing the most numerous form of preserved specimens in the museum’s vast bird collection. Whether or not adjacent taxidermy mounts seem more alive because they share display space with the skins is something you may judge for yourself during your next museum visit.